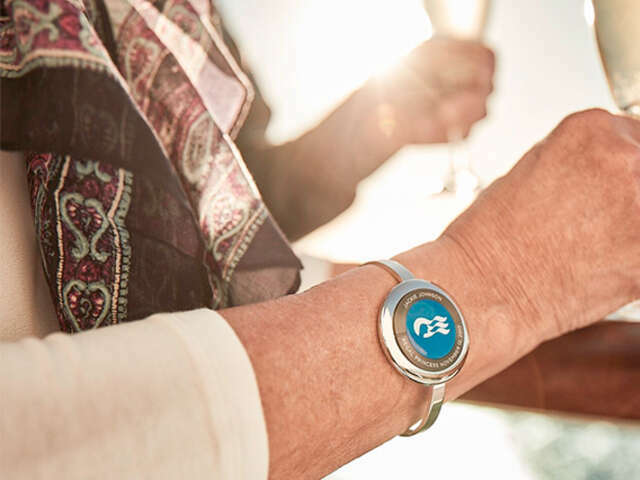 Carnival's new Ocean Medallion is wearable tech for passengers! A pendant on a wristband in a clip or placed in a pocket that will eliminate keycards! Carnival Corporation & plc’s new Ocean Medallion is wearable tech for passengers, a 1.8-ounce disc (about the size of a quarter) that can be worn as a pendant on a wristband in a clip, or placed in a pocket, that will do everything from eliminate keycards by unlocking staterooms as passengers approach their stateroom door, to streamlining and expediting the port embarkation and disembarkation process, to allowing passengers to make onboard purchases without any transaction, cards or paper. In addition to stateroom access and onboard purchases, the Ocean Medallion will also enable passengers to locate friends and family around the cruise ship, deliver enhanced dining experiences based on food and beverage preferences, power an array of interactive gaming and immersive entertainment experiences and significantly enhance interactions with crew members and guests, says the cruise company. The medallion can be accessorized with jewelry, clips, key chains and bands or carried in a pocket or pocketbook. Powered by proprietary technology developed by Carnival Corporation that features an ‘Internet of Things’ (IoT) network of intelligent sensors and experiential computing devices, the Ocean Medallion “revolutionizes guest service not only for the cruise industry, but the broader vacation industry”. It will be officially introduced by Carnival Corp. CEO Arnold Donald on Jan. 5 when he becomes the first travel industry executive to deliver the opening keynote address at CES, the world’s largest annual consumer technology trade show.